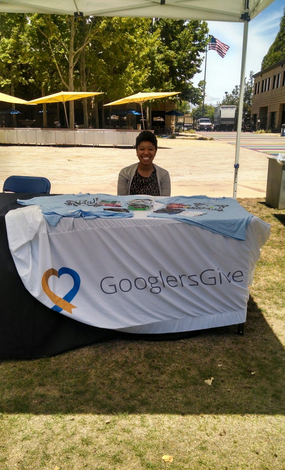 For today's post, meet Shelbey Roberts, a BOLD intern in Mountain View on the GooglersGive team. I’m an Android (kind of)! 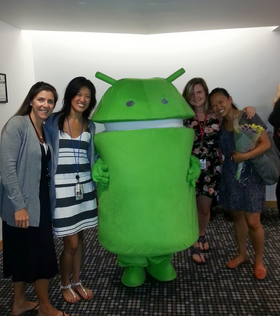 Last summer, one of my internship "projects" included walking around the Google New York office in a massively large, lime green Android costume greeting Nooglers (newly hired Googlers). One time, I watched a nightly news special on TV and it profiled Google and how it is consistently ranked among one of the best places to work in the entire world. I thought it was so interesting how Google developed such a successful company-wide operations strategy while still truly caring about their employees as human beings and being socially conscious of the world. One day I thought, “Wouldn’t it be cool to be able to say I interned for a place like that?” From there, I applied and the rest is history! I’m an anchor and a producer for the University of Michigan’s student-run television station called WOLV-TV. I write news content, operate cameras and audio switchboards and I get to be on air for our campus-wide audience! It’s hard work and long hours, but so much fun! 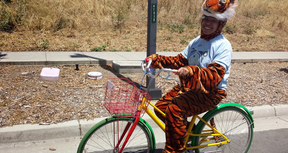 As a BOLD intern, I work with the GooglersGive team which coordinates many of the volunteering and giving initiatives that allow Googlers to help out local communities and other places around the world. My core project includes developing, advertising, distributing and analyzing a global GooglersGive internal survey, of which we use the feedback to improve Googlers’ overall experience with our volunteering and giving programs as well as increase participation. The best part about working with my manager and the rest of my team is that our entire job is to come together to develop and implement strategies that will help improve the communities around us and around the globe. From organizing company-wide community service opportunities, to encouraging employees to donate to charity, to launching environmental, hunger, and education campaigns, we are able to provide Googlers with opportunities to give back in a tangible way. We make an impact and it’s a great feeling! When you’re working with a team, a positive attitude goes a longgg way! Team members tend to appreciate seeing a smiling face or hearing an encouraging word especially in the midst of stressful projects and tight deadlines. 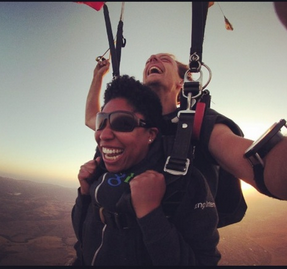 That kind of happy spirit is contagious! Plus nobody likes working with a negative Nancy! The coolest thing I find is that Google trusts its interns to work on projects that full-time employees would work on. In my case, my team implements changes to their global volunteering and giving programs partly as a result of the data results that I provide them with. Even as an intern, my team not only values my opinions, but they also encourage me to voice my thoughts on how we as a team can improve the work that we do. It’s nice to know that I am able to contribute. I have officially overcome my discomfort with numbers! Before this summer, I was never the most confident person when it came to statistics and other forms of math. Quite frankly, if it had to do with numbers, I wanted nothing to do with it. But this summer, my entire project is data driven which requires me to frequently use math and problem solving. With the help of my team, I have been able to do things like learn Excel, analyze data, and transform a weakness into a developing skill. I am very proud of myself for keeping an open mind throughout this entire project! To me, if you’re Googley, you’re not only intelligent and capable of doing your job, but you also convey a personality of friendliness and willingness to get to know others. The chicken, waffle, egg and bacon breakfast sandwich from the Cluck It Up food truck is absolutely incredible! It’s a glorious mix of sweet, salty and unhealthy topped off with bacon! First step: You won’t know until you try, so just apply! Second step: Really use the application to showcase who you are as a person. Many students who apply have the performance skills needed for the job, but try to find your personal Googley fact and include it. Maybe you broke a world record, or you’re a national champion of something, or you started your own business or maybe you just have a very interesting personal background story. Whatever your BOLD fact is, think about highlighting it to show what sets you apart from everyone else. Our interns have the opportunity to work on some of Google’s most cutting edge and innovative projects - not only in engineering, but across sales and other business functions, bringing a fresh perspective to the work done at Google. To show you just how much of an impact interns make and to highlight their unique experiences, we’re bringing you a special blog series: Google Intern Insights.